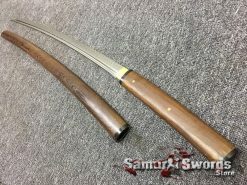 Date Produced: Edo Period from 1603 to 1868 A.D.
Shirasaya Sword are Japanese Shirasaya that are stripped down to the blade. 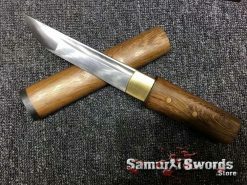 This has a simple and plain wooden handle. 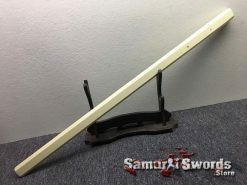 Shirasaya when translated means white or plain scabbard. 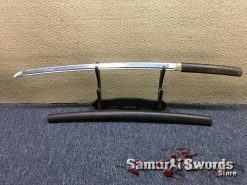 Because this lacks a hand guard and ito-maki or handle wrap this cannot be used as cutters. 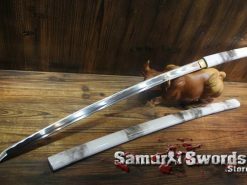 The use of Shirasaya can be traced back to feudal Japan. This was invented to hold the weapon when carried in public. 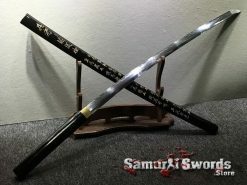 After a long period of conflict, there was a time when the government imposed certain regulations on the Samurai class. 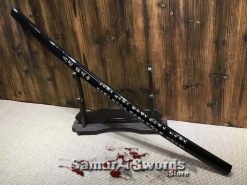 Swords are not allowed to be carried by anyone in public which includes the Samurai class. 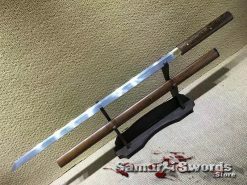 During combat, Japanese swords were carried in elaborate design Koshirae. 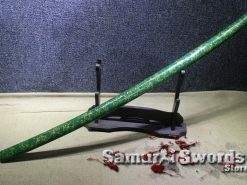 The cross section shape of the Shirasaya is different than that of a working saya. 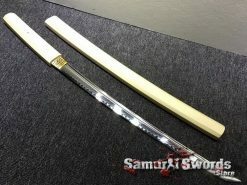 This sword has a tight tolerance between the mekugi and the tsuka. 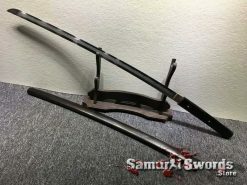 The blade is double pinned. It is not intended for cutting. 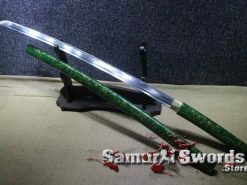 When it was time to go home and there is a need to store the sword for a long period of time, the Shirasaya was used. 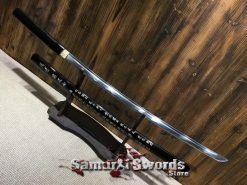 This protects the valuable sword. 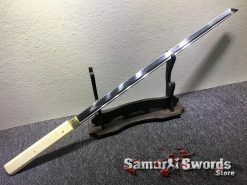 In fiction and in real life, members of the Yakuza or Japanese Mafia used this as a partially concealed blade when they want to dispatch their rivals or enemies. 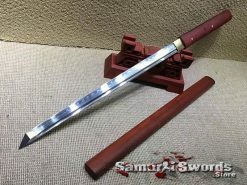 Modern day Samurai Shirasaya are made of Musashi rosewood. This makes a cutting edge attractive display when use today. 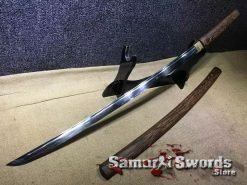 Shirasaya is basically use for storage, transport or for display purposes. 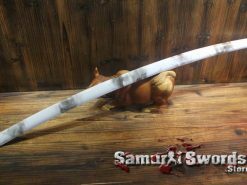 From time to time, these are used as disguised weapons and are made famous by Japanese gangs and Yakuza movies. 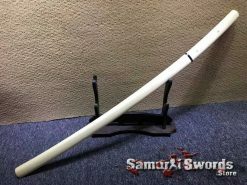 Shirasaya allows the sword to “breath” through the scabbard. This means it should not be painted or lacquered. 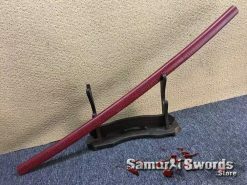 It is therefore a must to find a scabbard made of natural wood without finishing. 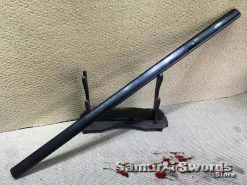 The shirasaya was often compared to a shikomizue. However, there is a difference between how these two were used. They are similar in the way they appear because of the undecorated exterior. 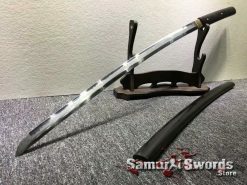 The similarity ends here because shikomizue is a hidden mounting to conceal the blade. It looks similar to a walking stick. 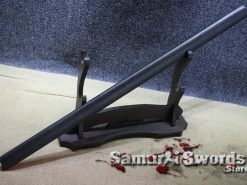 The mounting use conceals other weapons like hooks and chains. 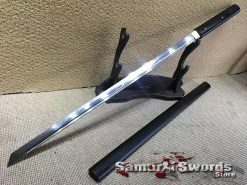 This is the reason why shikomizue was often identified with Ninjas. 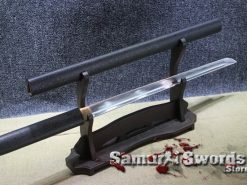 Modern day versions of this scabbard were elaborate than its historic version to make this more attractive in the eyes of the viewers whether in television or films. 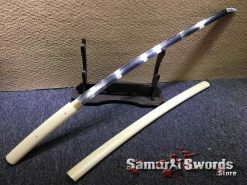 Some enterprising individuals markets the materials that they use on their shirasaya sword as being one of a kind. 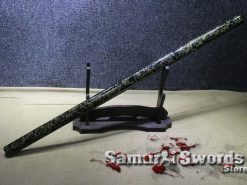 The rule of thumb is that a thick saya than the handle will disrupt the flow along its length. However, this is noticeable only when closely inspected. Some versions feature a single mekugi peg made of bamboo. 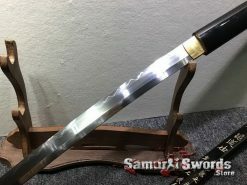 This is a rare feature in Japanese Samurai Shirasaya. An emphasis during the time of making the blade calls for a razor sharp blade. 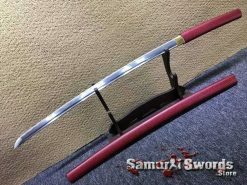 The blade should be seriously sharp and the thin blade must have a tapering on its edge. If only the myth that to test a sword’s sharpness calls for a paper cutting test this would pass with flying colors. 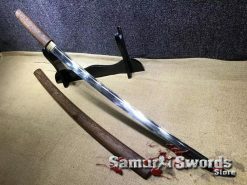 Versions made today are not as differentially hardened as Shirasaya of long ago. 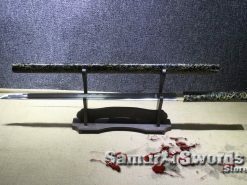 The hamon is wire brush which makes it look fine. 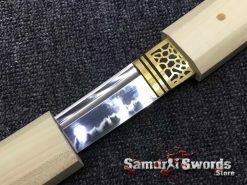 The Kissaki or tip of the blade is nicely finished and flows cleanly on the rest of the blade. 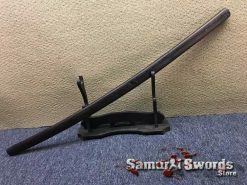 If planning to purchase a Shirasaya the decision relies on personal preference. Choose between several types of wood, Ebony wood, Maple wood, Rosewood, Redwood or Hardwood. 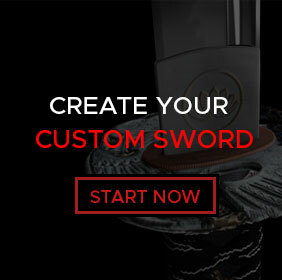 Choose between traditional folded steel, or clay tempered if you are looking for a functional blade. 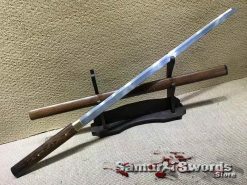 Using a clay temper process produces a sword with genuine hamon. All of our blades are full tang and hand sharpened. The tang is secured with two mekugi pegs. 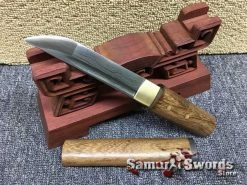 A blade that is both beautiful as well as functional will fit the bill perfectly. 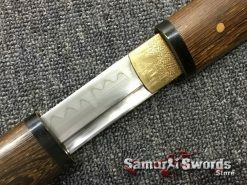 Shirasaya is a popular choice among collectors today.